The Freedom Foundation plans an email and canvassing campaign to inform Oregon's public-sector workers that union fees are no longer mandatory. SALEM — The Freedom Foundation on Monday announced the launch of a campaign to inform thousands of public-sector employees in Oregon about their new ability to opt out of union fees in the wake of a landmark U.S. Supreme Court decision last week. The court ruled 5-to-4 in Janus v. AFSCME Council 31 June 27 that mandatory dues violate free speech rights of public sector workers who object to union positions. The opinion by the conservative majority overturned 40 years of case law that held that unions could take fees from non-member workers to pay for collective bargaining. "The Janus decision marks the start of the end of the reign of government unions' political influence, but more importantly than that, it means that public employees now have the ability to go out and give themselves a raise by ceasing to pay union dues," said Aaron Withe, Oregon director of the Freedom Foundation, an anti-union organization that has bankrolled some local legal challenges of mandatory dues. The campaign involves an email blitz directed at public employees and canvassing outside of state government buildings, Withe said. The Freedom Foundation also will offer public employees assistance in the opt-out process, he said. 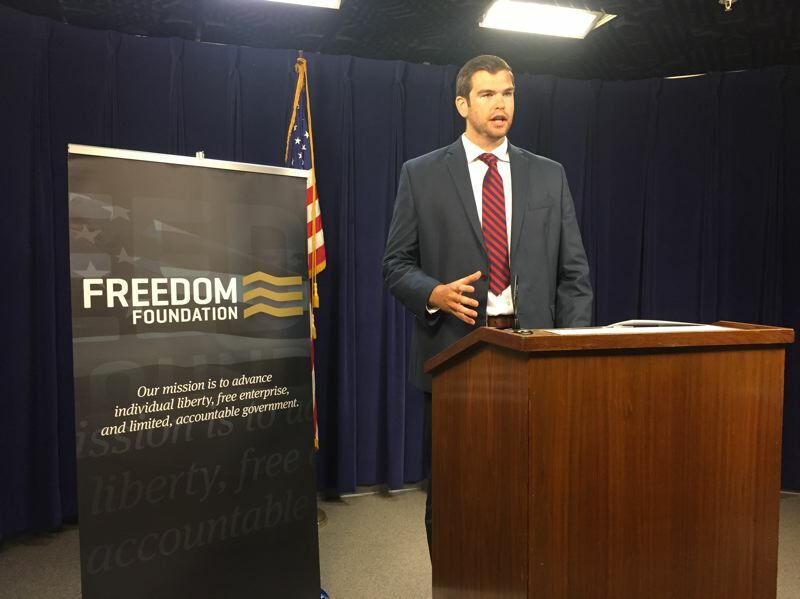 The Freedom Foundation has obtained the names and email addresses of more than 100,000 Oregon government employees through public records requests, he said. The court ruling means unions in Oregon and the other 21 states with mandatory dues are likely to see a loss of revenue and reductions to their budgets. The National Education Association — the largest teachers' union in the country — projects an 8 percent loss in membership and a $28 million reduction in its budget in the coming year, Education Week reported Monday. However, another recent ruling about mandatory dues for home-care workers suggests that union membership will continue to increase even as some non-member workers opt out of paying dues, union leaders said. In June 2014, the U.S. Supreme Court ruled in Harris v. Quinn that home-care workers who receive public funds as contractors are exempt from the mandatory union fees public sector employees must pay. Service Employees International Union Local 503 has seen a steady increase in home-care worker membership, from 13,824 in 2014 to 17,682 this year, said union spokeswoman Jill Bakken. Overall, about 70 percent of home-care workers who contract with the state are dues-paying union members, Bakken said. In a news conference Monday, Withe said at least 1,000 Oregon public-sector workers have signed up on their website to opt out of union dues. "The Freedom Foundation has proven to be spreading fake news," Bakken said. "The way they tried to justify that was 1,000 people visited their website. Web traffic doesn't translate into a cancellation. It's just one example of them lying and spread false information to appease their donors and to try to frighten workers staying with their union." "I think our union will look different in a year, but I don't think it'll be because of Freedom Foundation dark money pouring into the state."